One particularly frustrating way in which your computer might not start is when you encounter an issue during the Windows startup process but have nothing to go on – no Blue Screen of Death or another error message. 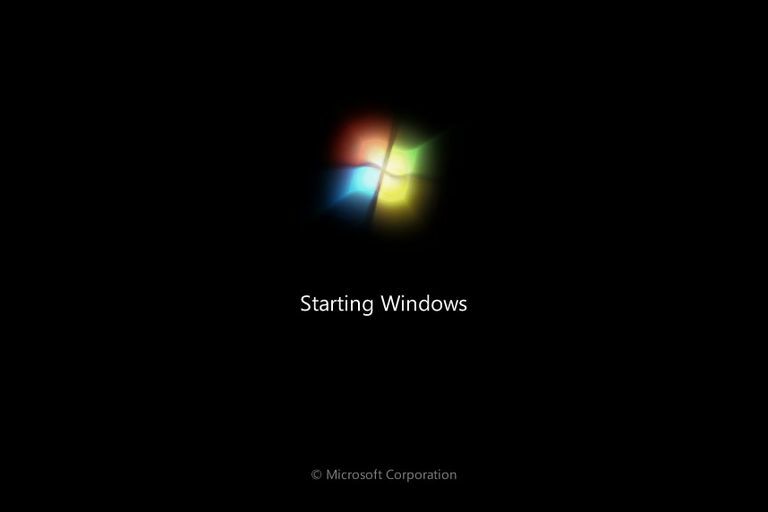 Maybe Windows 7 hangs on startup, forcing you to look at "Starting Windows" for an hour. You're forced to restart manually, only to watch it freeze at the same place again. Or maybe your Windows 10 computer restarts automatically sometime after it begins to load, causing what's called a "reboot loop." Sometimes your computer might even stop at a point where you can move your mouse around but nothing happens. Windows might seem like it's still trying to start but, eventually, you have to manually reboot your computer, only to see the same behavior again! If you see a blue screen full of information flash on the screen before your computer reboots, this is a Blue Screen of Death and your computer happens to be configured to reboot after one. If your PC is, in fact, booting to the Windows login screen, you see any kind of error message, or if you're not even getting past the POST, see How to Fix a Computer That Won't Turn On for a better troubleshooting guide for your specific problem. Applies To: Any version of Windows, including Windows 10, Windows 8, Windows 7, Windows Vista, and Windows XP. Power your computer off and then back on. Unfortunately, you can't properly restart Windows because it's not fully loaded, so you'll have to do it manually. Many things go on in the background when Windows is starting up. Sometimes things don't work exactly as they should, especially after Windows has installed updates or there were other major changes to the operating system the last time it was up and running. A restart might be all Windows needs to get back on track. Start Windows in Safe Mode, if you can, and then restart your computer properly. That's right – don't do anything in Safe Mode, just get in and restart. Like you read in the first idea above, sometimes updates or other things get hung up. If a forced, total restart doesn't work, try it from Safe Mode. This works more often than you'd think. Repair your Windows installation. A common reason for Windows to freeze up or reboot automatically during the Windows startup process is because one or more important Windows files are damaged or missing. Repairing Windows replaces these important files without removing or changing anything else on your computer. In Windows 10, this is called Reset This PC. Windows 8 calls it Reset Your PC or Refresh Your PC. In Windows 7 and Vista, this is called a Startup Repair. Windows XP refers to it as a Repair Installation. The Windows XP Repair Installation is more complicated and has more drawbacks than the repair options available in the other operating systems. So, if you're an XP user, you may want to wait until you've tried Steps 4 through 6 before giving this a shot. Start Windows using Last Known Good Configuration. If you've just made a change to your computer that you suspect might have caused Windows to stop booting properly, starting with the Last Known Good Configuration could help. Last Known Good Configuration will return many important settings to the states they were in the last time Windows started successfully, hopefully solving this problem and allowing you back into Windows. Start Windows in Safe Mode and then use System Restore to undo recent changes. Windows could freeze, stop, or reboot during the startup process because of damage to a driver, important file, or part of the registry. A System Restore will return all of those things to their last working order which could solve your problem entirely. Depending on the reason that Windows isn't starting, you might not even be able to enter Safe Mode. Fortunately, you can also perform a System Restore from Advanced Startup Options in Windows 10 or Windows 8, or System Recovery Options in Windows 7 or Windows Vista, as well as from your Windows Setup DVD. Please know that you will not be able to undo a System Restore if it's done from Safe Mode or from System Recovery Options. You might not care since you can't start Windows normally anyway, but it's something you should be aware of. Scan your computer for viruses, again, from Safe Mode. A virus or other kind of malware might have caused a serious enough problem with a part of Windows to cause it to stop starting properly. Clear the CMOS. Clearing the BIOS memory on your motherboard will return the BIOS settings to their factory default levels. A BIOS misconfiguration could be the reason that Windows is freezing during startup. If clearing the CMOS does fix your Windows startup problem, make sure future changes in BIOS are completed one at a time so if the problem returns, you'll know which change caused the problem. Replace the CMOS battery if your computer is more than three years old or if it's been off for an extended amount of time. CMOS batteries are very inexpensive and one that is no longer keeping a charge can certainly be the cause of Windows freezing, stopping, or rebooting during startup. Reseat everything you can get your hands on. Reseating will reestablish the various connections inside your computer and is very often a "magic" fix to startup problems like this, especially reboot loops and freezes. Unplug and reattach your keyboard, mouse, and other external devices as well. Check for causes of electrical shorts inside your computer. An electrical short is often the cause of reboot loops and hard freezes while Windows is starting. Test the RAM. If one of your computer's RAM modules fails completely, your computer won't even turn on. Most of the time, however, memory fails slowly and will work up to a point. If your system memory is failing, your computer may power on but then freeze, stop, or reboot continuously at some point during Windows startup. Replace the memory in your computer if the memory test shows any kind of problem. Test the power supply. Just because your computer initially turns on does not mean that the power supply is working. While it might not be common for your computer to get all the way to the Windows startup process with a damaged power supply, it does happen and is worth a look. Replace your power supply if your tests show a problem with it. Replace the hard drive's data cable. If the cable that connects the hard drive to the motherboard is damaged or not working, then you could see all kinds of issues while Windows is loading - including freezing, stopping, and reboot loops. Don't have a spare hard drive data cable? You can pick one up at any electronics store or you could borrow the one that another drive is using, like your optical drive, assuming, of course, that's it's the same type of cable. Newer drives use SATA cables and older drives use PATA cables. A loose hard drive data cable can cause the same issues that a damaged one can but, hopefully, you checked for connection issues with the cable back in Step 9. Make sure you've tried your best to complete the troubleshooting steps up to this one. Steps 14 and 15 both involve more difficult and destructive solutions to freezing, stopping, and continuous reboot problems during Windows startup. It may be that one of the below solutions is necessary to fix your problem but if you haven't been diligent in your troubleshooting up to this point, you can't know for sure that one of the easier solutions above isn't the right one. Test the hard drive. A physical problem with your hard drive is certainly a reason why Windows might reboot continuously, freeze completely, or stop in its tracks. A hard drive that can't read and write information properly certainly can't load an operating system properly. Replace your hard drive if your tests show an issue. After replacing the hard drive, you'll need to perform a new installation of Windows. If your hard drive passes your test, the hard drive is physically fine, so the cause of the problem must be with Windows, in which case the next step will solve the problem. Perform a Clean Install of Windows. This type of installation will completely erase the drive and install Windows again from scratch. In Step 3, we advised that you try to solve Windows-caused startup issues by repairing Windows. Since that method of fixing important Windows files is non-destructive, make certain that you've tried that before the completely destructive, last-resort clean install in this step.